The Scottish FA have confirmed that the national side will face Croatia in a friendly on 26th March. The game will represent the first match for the new Scotland manager with a decision about who should be chosen to succeed Alex McLeish expected to be made by the end of January. 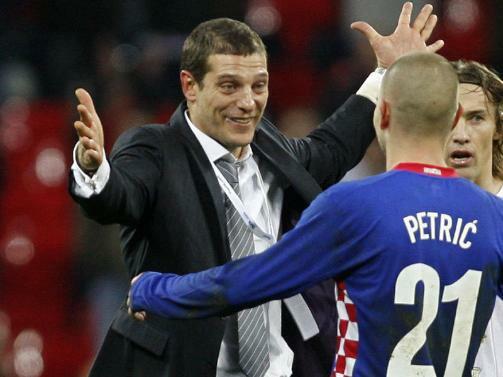 Slaven Bilic's Croatia side were responsible for ending England's hopes of reaching Euro 2008 when they recorded a 3-2 victory at Wembley last November. The SFA's chief executive Gordon Smith feels that a fixture against a side ranked 10th in the world will provide the kind of test Scotland need if they are to build on their impressive, if ultimately unsuccessful, Euro 2008 qualification bid. "This will be the new manager's first game in charge," said Smith. "I know that our supporters will turn out in big numbers to support him and the team as we enter a bright new era for Scottish football. "We saw in their matches in the Euro qualifiers against England that Croatia has an exciting squad who play great football. "They have an impressive pedigree on the world stage, finishing third in the 1998 World Cup. "If we ourselves want to keep on improving, then these are exactly the types of teams that we should be playing. "Our football is on the up, and we are only a few places below Croatia in the rankings. What we have to do, though, is get back to the situation where we regularly qualify for major championships. "This is what Croatia do, and this is what we must seek to emulate. "I firmly believe that playing against better teams shows us the standard that we have to reach. That is why I was so keen to negotiate a friendly against Croatia. "We have a great squad of players who are improving all the time and we will soon have a new manager in place who we all hope will lead us to the World Cup and beyond."